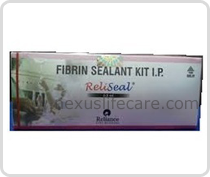 Used in :- Reliseal Kit, also known as bovine pancreatic trypsin inhibitor, BPTI (Trasylol, Bayer) is a protein, Reliseal Kit is used as medication administered by injection to reduce bleeding during complex surgery, such as heart and liver surgery. Its main effect is the slowing down of fibrinolysis, the process that leads to the breakdown of blood clots. The aim in its use is to decrease the need for blood transfusions during surgery, as well as end-organ damage due to hypotension (low blood pressure) as a result of marked blood loss.